Tanks that have strong turret armour work well on Minsk. There are many places to get hull down and fight enemy tanks. 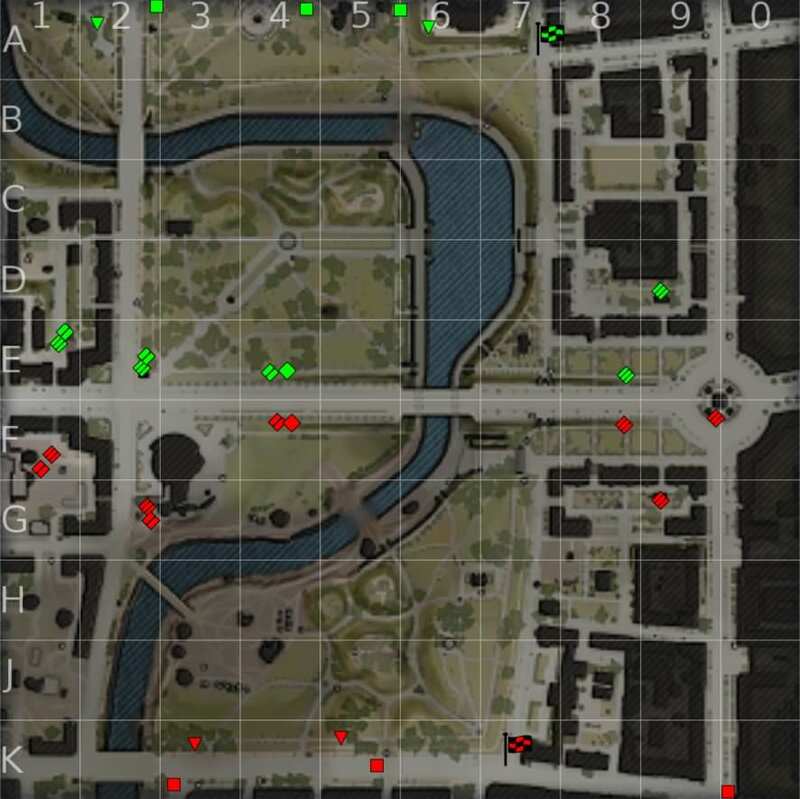 The map below shows positions where tanks can go. The center of the 8-9 lines can be played by tanks with good turrets. The more gun depression your tank has the easier it is to shoot enemy tanks while staying hull down. Beware of tanks shooting from the middle. If your team is able to push past the center ridge, the stairs provide a hull down spot for tall tanks or shorter tanks with more than 6 degrees of gun depression. Tanks defending the stairs can sidescrape the corner as shown in one of the pictures below. For protecting the 9 line entrance to the center ridge, there are hull down positions on both sides. There is no safe passage to run away from this position. Using the raised area around the monument at E9/F9, a tall tank can sit hull down and shoot tanks poking the corner at D9. The street between E0 and F0 provides no positions to be hull down and should only be used if the enemy is distracted. If there is a tank that is flat and has a good plate frontal plate such as an Object 430U, it will be able to be hull down against you. The archway at D9 can fit tanks such as the WZ-111-5a but is too narrow for tanks such as the Super Conqueror or the M48 Patton. Other areas on the 8 and 9 lines (on the D and G lines for each respective side) are mostly open space. There is one obstacle on each side that tanks can get hull down behind, and corners that tanks can sidescrape. There is no cover that can be used when running away. By going up the ridge on the center map you can shoot the heavies in the side. The heavies can shoot back at you and in some places be hull down. On the two line there are places on either side for tanks to get hull down. The spot at E2 is much closer to than the other spot, which can cause you to get shot in the side. The spot at G2 sits further back and has a building that blocks shots coming from the middle or the 8-9 lines. The G2 spot counters the E2 spot. Sitting on the top of the ramp at G3 allows you to shoot tanks in the heavy area. The position puts the heavies outside of the max spotting range, but still allows you to render them. Pulling back from the position is safe as the large building protects you from the middle. From the tunnels under the bridge at the center of the map, there are shots on the people right before the bridge. This can be useful when the 1-2 lines are lost and the 8-9 lines are won. The slopes on the 1 and 2 lines allow for tanks with varying amounts of gun depression to be hull down. The more gun depression you have the more effectively you can play this area. The slopes along the F and G lines are not as steep as the slopes on the other side. To defend the area along the C-E lines, tanks can sit in the places at D1, which are shown below. Only tanks with lots of gun depression can play the hill, while tanks that are flatter will be able to sit hull down behind the barricades. For defending tanks pushing through the 1 line, the corner can be sidescraped. The base of the house at G1 can be used to defend from multiple angles. However tanks that are sitting on the tops of the buildings can shoot down if they have enough gun depression. Tanks that are sitting on the top of the building can be exposing part of their hull and turret while being blocked by the building. If you plan to sit on top of the building, do not pull to the very front. There is a spot at J1 which can also be used to defend a push down the 1 line. It works better for taller tanks as they can see over the piles easier. The cap circle on the A and B lines is much harder to reset than the other side. The hill provides cover from defenders on the 1-2 lines. The buildings provide protection from defenders at the middle. The cap circle on the K line has one place to hide from defenders coming from the 1-2 lines. Tanks can get hull down in the position shown below. Otherwise there is no cover in the cap circle. Thanks for reading my guide and I hope it benefits your games on Minsk! Edited by Mkroets, Sep 17 2018 - 02:05. I noticed that when playing arty from north end, you can aim and fire right through one on the buildings in F6 and hit tanks in the courtyard.